Florida’s warm breezes welcomed the motorcycle community to what most consider the grand opening of the east coast motorcycle season. I’ve been to Daytona Beach for the Daytona 500, but unfortunately never able to visit during Bike week. Something to add to my ‘bucket list’ I suppose as Bruce Rossmeyers Harley Davidson at Destination Daytona and New Smyrna Harley Davidson play host to tens of thousands of bikers from around the world. There are a number of biker venues like, Main Street’s Boothill Saloon, Iron Horse Saloon, Cabbage Patch, Gilly’s Pub 44, Broken Spoke Saloon, and Froggys to keep a person occupied. I’m not sure if this is a predictor of the 2011 riding/rally season across the U.S. or not. What do you think? Will you be attending more, same or fewer motorcycle rallies than last year? I’ll be attending fewer this year due to scheduling issues. But, there were a couple of other notable items that will mark this years Bike week in the history books. One was a sonic boom as the space shuttle Discovery began its rapid descent over the Atlantic Ocean and skillful final landing. After 39 missions, the space shuttle Discovery landed for the last time March 10th at Kennedy Space Center, about an hour from Daytona Beach. The other and one that is most unfortunate was former Wisconsin state Sen. Dave Zien and AMA Motorcycle Hall of Famer was seriously injured on Sunday in a motorcycle accident in Florida. The accident occurred at 6:15 a.m. Sunday on eastbound Interstate 10 near Marianna in Jackson County. Mr. Zien was driving in the inside lane when a Ford SUV crossed over from the right lane and into the median. The driver lost control of the vehicle and it rolled, flipping onto its side on the interstate facing north. Zien attempted to avoid the crash scene but was unable to, clipping the back of the SUV. Zien was thrown from his 2009 Harley-Davidson bike where he was reported to have lost part of his left leg, and was airlifted to Tallahassee Memorial Medical Center, where at last report he was in stable condition. 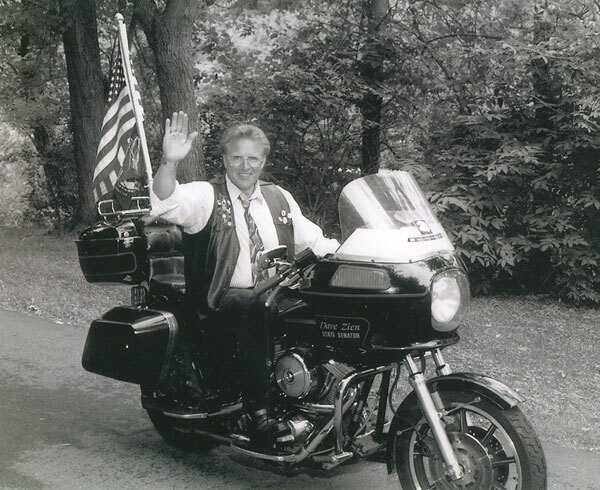 Mr. Zien is best known as an AMA Hall of Famer, for defending motorcyclists’ rights while serving in the Wisconsin Legislature and true to his words he was not wearing a helmet in this accident. Mr. Zien served as vice president of the Wisconsin Better Bikers Association and was known for riding around on his Harley-Davidson with a full-size American and Wisconsin flags on his bike. In addition, back in 2005, Zien was the main author of the Wisconsin RURA (Roadway Users Responsibility Act) 466. That bill provides for increased penalties for vehicle operators who violate the right-of-way of other roadway users. And in my opinion I hope there is a similar law in Florida because the driver of the SUV, Ryan G. Matheny of Marietta, OH., was charged with failure to maintain lane and driving with a suspended license. Here’s hoping Mr. Zien a speedy recovery.